This article explains about worms in chickens and why performing worm counts is useful for farmers to monitor the health of their chickens. We regularly worm our cats, dogs, horses and cows; why not worm our chickens? Worms in chickens can be divided into two major groups. The first group most commonly affect the gastrointestinal tract of chicken. The second group is gape worms which live in a bird’s trachea. This is the smallest of all and most dangerous if present in high numbers. They grow up to 1.5cm and found mostly in lower intestinal tract. 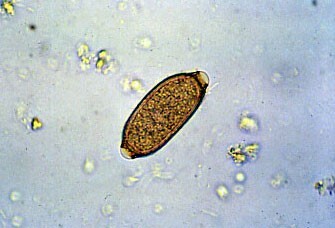 Capillaria causes diarrhea, anaemia, inflammation, hemorrhage and bird’s look hunched and dull. This results in decreased egg production and low fertility. In severe cases it leads to death. This is the most common and largest worm in chickens which can grow up to 7 cm and lives in the small intestine of chickens. These worms cause severe damage to gut lining and result in reduced food uptake. Highly infected birds may cause diarrhoea lethargy, and reduced egg production. This worm is also called as caecal worm as it is most commonly found in caecum of chickens. Presence of this worm is non pathological but chickens can act as vectors for blackhead disease. Gapeworms are commonly called as Syngamus trachea, they are roundworms and live in trachea of chickens. Affected birds have open mouthed breathing and results in difficulty in breathing. In severe cases it causes suffocation and leads to death. When we observe bird droppings there will be a presence of coccidiosis. Coccidiosis is a parasite which damages the gut walls of chickens. There are six different species of coccidiosis. Each of these species may be working together to cause disease. The Oocyst has a very thick wall and it is resistant from heat, cold and disinfectants. When eaten by the chicken, it is broken down by chemicals in the gut and releases the infective form of coccidiosis. Eventually this results in production of more oocysts and passed out in faeces and infect other chickens. Chickens are very susceptible to mite infestation. Mites can crawl up to human and can cause irritation. What can worms do to birds? Loss of shell colour and strength, yolk colour and eg size. Therefore performing a worm count is important for farmers as it helps them monitor the health of the birds. A worm count is an examination of faeces under a microscope. A count is taken of the number of worm eggs present and the results are used to monitor the worm burden. The results are represented as eggs per gram of faeces. The number of eggs is a representation of adult worms in the gut of chicken. Express Micro Science routinely carries out worm count testing so that poultry farmers can control their birds health through worming treatment. This keeps their birds healthy and their egg production high. We also offer Salmonella testing for poultry and eggs to meet the British Lion Code of Quality. These tests are of course, UKAS accredited and we have been approved by both the Department for Environment, Food, and Rural Affairs (DEFRA), and the Scottish Government.